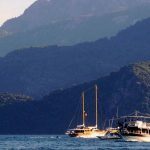 We can surely say that marmaris boat trips are the most popular one amongst the all kind of daily excursions in Marmaris. So let’s look down to see what boat trips are waiting for us during the holiday in Marmaris. Of course, beyond any dispute, the most famous attraction of Marmaris is the beach and its famous bays. Well, the things you can do while you are here in Marmaris are numerous. But how would it be possible to see all those hidden corners and the unique bays of Marmaris? How to travel around different seas with different tones of a blue and wide range of multi-coloured and shiny fish? When you visit Marmaris and especially if you are a sea lover like us, we bet the first thing that catches your eye will be lots of boats dropped their anchors in the shore of Marmaris. Well, you have found your answer then, they will make it possible for you to experience swimming in the waters of various bays even the islands of Marmaris. Your pleasure, happiness and comfort will be 100% guaranteed during those trips. Why should you spend at least one day with those boat tour? We always try to underline the fact that when you come to Marmaris, you should stay at least one week because of the different opportunities Marmaris offers you generously. Therefore, spending at least one day by a boat tour will be such a great opportunity to make use of the time well and utilise your holiday in Marmaris. However, the reason why we always advise you to try Boat Tours in Marmaris is not only you can make a use of time well. We also know that it will be such a remarkable memory. Let us briefly and broadly summarise boat day for you. At the outset of all, the first thing you should do is picking your daily boat tour with different routes. Of course, as you would appreciate our advice would be to try all of them one by one if you have enough time. However, if you have to make a choice between them, kindly see the below-listed options which we have prepared detailed articles with regard to each one of them in our Excursions section. When you decide booking the All Inclusive Boat Trip, it is guaranteed that you will have a superb day full of sunshine, incredibly beautiful tones of blue, music, top notch memories and joy. The boat will pick up all the attendants at 9 am approx, leave the shore and protrude to sea. The schedule is so simple and efficient. Joyful but not tiring at the same time. Your boat will travel around the beautiful bays of Marmaris, pop into the well-known islands worth to see and let you spend some free time at every stop. The boat trip includes a visit to Paradise Island, Kumlubük Beach, Turunç and Phosphorus Cave. Also when we say all-inclusive, we mean it! You will be provided with transportation service from your hotel to the boat and back; lunch service with different menu choices prepared for your preference, local beverages and of course insurance. If you fancy going on this all inclusive boat trip, please keep in mind that it might be better to do it at the beginning of your holiday in Marmaris so that you can shape your other days by quality choices. For instance, when your boat visits Turunç and lets you have some spare time there, we bet you won’t want to leave from there. But unfortunately, you have to. So wouldn’t it be better if you still have a few more days to spend in Marmaris so that you could rent a bike or hire a car from one of Marmaris Car Hire Companies and spend an entire day exploring Turunç? This also is one of the most preferred boat trips in Marmaris. It’s indeed similar in some ways with All Inclusive Boat Trip hence offering all inclusive concept but differs in lots of ways at the same time. Like you can make a perfect start to the new promising day with a full English breakfast and you will have access to the wide range of alcoholic/non-alcoholic drinks during the trip. We assure you that there won’t be a single time you won’t be treated like a king or a queen! Cleopatra Beach is located within the borders of Sedir Island and famous for its unique sand impossible to find elsewhere except Red Sea. Also, the beach also does the honours to a perfect love story between Cleopatra, queen of Egypt and her crazy lover Mark Antonius. Please keep in mind that Cleopatra Island Boat Trip is also counted in all inclusive concepts hence you won’t have to pay for anything excluding your personal spending and drinks on the boat. No need to read twice, no spelling mistakes, yes we offer you a daily trip to Rhodes which is the largest island in the Greek Dodecanese from Marmaris! We definitely understand you not being able to believe the opportunity to leave Turkey and visit Greece for a few hours and come back to Marmaris at the end of the day again. Your high-speed boat will pick you up at 9.30 and bring you back at 6 pm. You will have more than enough time to explore the cute narrow streets, must-to-see places and all attractions of Rhodes. In order to arrange Rhodes trip for you, we need nothing else than copy of your passport and of course enthusiasm! If you are willing to spend some time on a boat and wander around the bays of Marmaris but also want to spare some time of the day for some other attraction or simply just to relax, here is our advice that will be perfect for you! Marmaris fishing tour takes places in two sessions every day (one starting early in the morning- the other one in the afternoon) and each session lasts 4 hours approx. Please bear in mind that it doesn’t matter if you have some fishing experiences or if you are a first timer and believe you do not even need to have a talent or luck to catch any fish, the only thing matters is your enthusiasm! The fish tour does not only give you the chance of improving your fishing skills by the way, it also allows you to take a short swimming break and jump into the cool and clear sea from your boat at each stop. Would you believe us if we tell you that you can get a tour abroad with the largest Pirate ship not only in Turkey but also in Europe! Every summer, because of its exciting and mysterious feature, the pirate boat drums up lots of foreign and domestic tourists who come to Marmaris to spend their holiday. Especially children enjoy this trip that they will search to find hidden treasures while they are surrounded by real pirates! You, as adults can also enjoy the Pirate Boat trip either by jumping in the excitement with your beloved ones or enjoying a glass of cold drink ( you will be provided with unlimited consumption of local alcoholic and non-alcoholic drinks) while feeling the soft touch of the breeze into your hair accompanied with great sea and landscapes of Marmaris. The Barbossa Pirate Boat Trip in Marmaris accommodates 400 people, has a grand length of 42 metres and has 5 floors. Barbossa Pirate Boat Trip is also in the All Inclusive Concept but defers from the other boat tours by offering a stunning buffet at lunch time! We seem to hear that you are saying enough to the calm and peaceful activities full of tranquillity, is there anything else which can make our heart beats become faster and make us scream because of joy! Well, speed boat is just perfect for you then! We actually offer you to be the headliner of your own action movie for an hour, without exaggerating! You will taste the pure adrenaline while water splashing all over your skin when you are riding the jet-ski! The best thing of this attraction is that you can plan it anytime of the day and any day you wish! Dalyan, which is actually a separate town located within the borders of Ortaca district in Muğla, lies away from the coast. But you can reach the place by taking a Dalyan boat trip from the harbour. Take our advice and don’t go back home without seeing Dalyan and witness its uniqueness. It is not only well known and the get all the visitors’ attention every year because of the famous Dalyan Turtle Beach. Last but not the least – one of our favourite ones to be completely honest with you – Private Boat Trip is perfect for those who are more willing to spend a private day by their friends or family. The Private Boats can be booked from minimum of 2 people up to 50. You will be the only one who determines everything, you will pick your own boat which suits your need and preference; it can be a small and cute boat for you and your partner to spend a romantic day, on the other hand, it can also be nearly a small ship if you are planning this trip as a large group which consists of 50 people! Well, enough of us describing the wide range of boat trips that Marmaris offers to its visitors who have different expectations and demands, now it is your turn to make a move and come to Marmaris to experience them by yourself! Should you have further questions or if you simply fancy booking your trip, just give us a call and let us assist you throughout those trips!